Our range of products include smart line multi variable transmitters. The SmartLine SMV800 has the ability to calculate compensated mass or volume flow rate as a fourth process variable. Meter body-only components are also available to support third party and OEM metering solutions. In addition, it offers simple modularity, universal input for process temperature and advanced display with fail safe measurement helping users improve availability, reduce their inventory by up to 70% and maintenance cost by up to 30%. It is compliant with Experion® PKS and HART7 providing the highest level of compatibility assurance and integration capabilities. 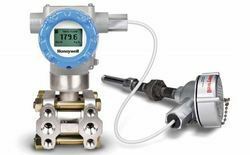 SmartLine Multivariable Transmitter leverages the proven SmartLine technology to measure three separate process variables by combining sensor technologies for static pressure, differential pressure and process temperature for air, gases, steam and liquids, with minimal process intrusions, lower total cost of ownership and superior performance for accurate and fail safe flow measurement. • HART7/DE protocol support With the addition of the SmartLine Multivariable Transmitter SMV800, the Honeywell SmartLine Pressure transmitter family now offers a complete range of absolute, differential, gauge pressure, including flanged and remote seal transmitters to suit every application need. Looking for “Smart Multivariable Transmitter”?